July 14, 2015 – New Horizons has obtained impressive new images of Pluto and its large moon Charon that highlight their compositional diversity. 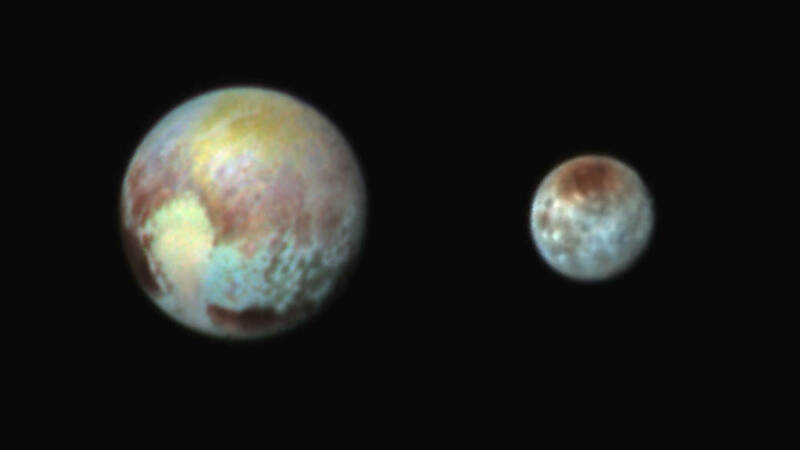 These are not actual color images of Pluto and Charon — they are shown here in exaggerated colors that make it easy to note the differences in surface material and features on each planetary body. The images were obtained using three of the color filters of the “Ralph” instrument, built by Ball Aerospace & Technologies Corp. of Boulder, Colorado. Ball’s 23-pound Ralph instrument aboard New Horizons hosts a suite of image detectors boasting resolution 10 times better than the human eye while using only seven watts of power – about the same as a night-light. Ralph is one of three cameras aboard the spacecraft, charged with making the maps that detail Pluto, its moons, and other Kuiper Belt objects. The image above was obtained on July 13 at 3:38 am EDT, one day before New Horizons’ closest approach to Pluto. The color data helps scientists understand the molecular make-up of ices on the surfaces of Pluto and Charon, as well as the age of geologic features such as craters. They can also tell us about surface changes caused by space “weather,” such as radiation. The new color images reveal that the “heart” of Pluto actually consists of two remarkably different-colored regions. In the false-color image, the heart consists of a western lobe shaped like an ice cream cone that appears peach color in this image. A mottled area on the right (east) side looks bluish. A mid-latitude band appears in shades ranging from pale blue through red. Even within the northern polar cap, in the upper part of the image, various shades of yellow-orange indicate subtle compositional differences. The surface of Charon is viewed using the same exaggerated color. The red on the dark northern polar cap of Charon is attributed to hydrocarbon and other molecules, a class of chemical compounds called tholins. The mottled colors at lower latitudes point to the diversity of terrains on Charon. At 5:49 AM MDT on Tuesday, July 14 New Horizons sped past Pluto at 30,800 miles per hour (49,600 kilometers per hour), with a suite of seven science instruments. As planned, New Horizons went incommunicado as it hurtled through the Pluto-Charon system busily gathering data. The New Horizons team will breathe a sigh of relief when New Horizons “phones home” at approximately 7:02 p.m. MDT on July 14. The mission to the icy dwarf planet completes the initial reconnaissance of the solar system. The New Horizons spacecraft was built for NASA by Southwest Research Institute (SwRI) and the Applied Physics Laboratory at Johns Hopkins. The mission’s principal investigator is SwRI’s Alan Stern of Boulder, Colorado.